Designs for four trophies on plinths shown as triangular compositions of military weapons, flags and insignia with a large urn and personal armour. You are here: CollectionsOnline / Designs for four trophies on plinths shown as triangular compositions of military weapons, flags and insignia with a large urn and personal armour. These designs are based on the Trophies of Marius from the Piazza Campidoglia, Rome, of which there are also versions in Adam vol.26/88-92, and those from Trajan's Column (see Charles-Louis Clérisseau (1721-1820) Dessins du musée de l'Ermitage Saint-Petersbourg, catalogue of an exhibition held at the Musée du Louvre, Paris, 1995, p.92, pl.1). In his unfinished essay on architectural theory of 1762 James Adam wrote '... military trophies are a noble resource...' (see J. Fleming, Robert Adam and His Circle in Edinburgh & Rome, London, 1962, p.318). 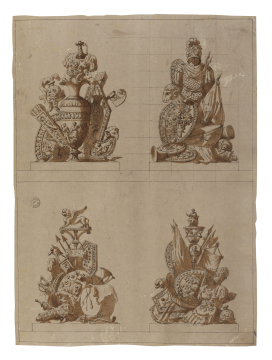 There are two panel designs based on similar trophies in Adam vol.19/89-90?, signed by Giuseppe Manocchi (c.1731-82) and dated 1766.